Preheat oven to 350 degrees F. Spread all hazelnuts (1 3/4 cup) out on a baking sheet and toast for 10 minutes. Reserve 1/2 cup of toasted hazelnuts for garnish. Place 1 1/4 cup hazelnuts, dates, and sea salt in a food processor and process for about 2 minutes, until the hazelnuts and dates form a meal. It should be somewhat moist, but not processed to the point of making a nut butter. Press crust into a tart pan or 9-inch springform pan. Place in the fridge until filling is ready. Chop the baking chocolate and add to a medium heat-safe bowl. Add coconut milk, coconut oil, honey, and cocoa powder to a pot. Whisk until combined. Set over medium-high heat, stirring frequently, until the mixture is steaming but not boiling. Pour over baking chocolate and let sit for a few minutes. With a rubber spatula, begin to stir slowly and steadily until the baking chocolate has melted completely and the mixture is shiny and smooth. Add vanilla and stir just to combine. Remove the crust from the fridge and add hazelnut butter, spreading out evenly over the bottom of the crust. Pour the filling into the prepared crust. Let set for at least 2 hours at room temperature or 1 hour refrigerated. Garnish with additional toasted hazelnuts, then slice and serve. To make your own hazelnut butter, toast 2 additional cups of hazelnuts as directed in step 1. Add the toasted hazelnuts to a high-powered blender or food processor and blend until smooth. For an alternative filling, you can pour half of the chocolate filling into the crust, then add the hazelnut butter. 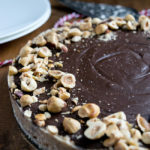 Finish it off with the rest of the chocolate filling, then use a knife to swirl the hazelnut butter and filling together.